Two principal stages of the program dwelt upon the following two lines of research: lamination (Fig. 1) and stratification (Figs. 2, 3). These sedimentation experiments have been conducted in still water with a continuous supply of heterogranular material. A deposit is obtained, giving the illusion of successive beds or laminae (Fig. 1). These laminae are the result of a spontaneous periodic and continuous grading process, which takes place immediately, following the deposition of the heterogranular mixture. 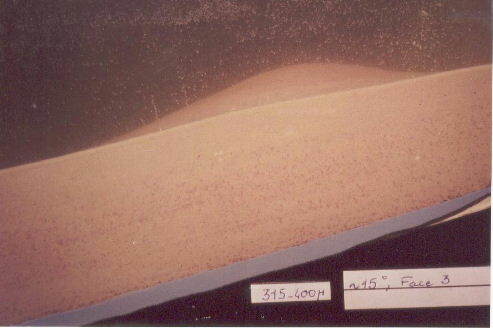 The thickness of the laminae appears to be independent of the sedimentation rate but increases with extreme differences in the particle size in the mixture. Where a horizontal current is involved, thin laminated layers developing laterally in the direction of the current are observed. The second series were performed at the Marseilles Institute of Fluid Mechanics. The experiments demonstrate that in still water, continuous deposition of heterogranular sediments gives rise to laminae, which disappear progressively as the height of the fall of particles into water (and apparently their size) increases. Laminae follow the slope of the upper part of the deposit. 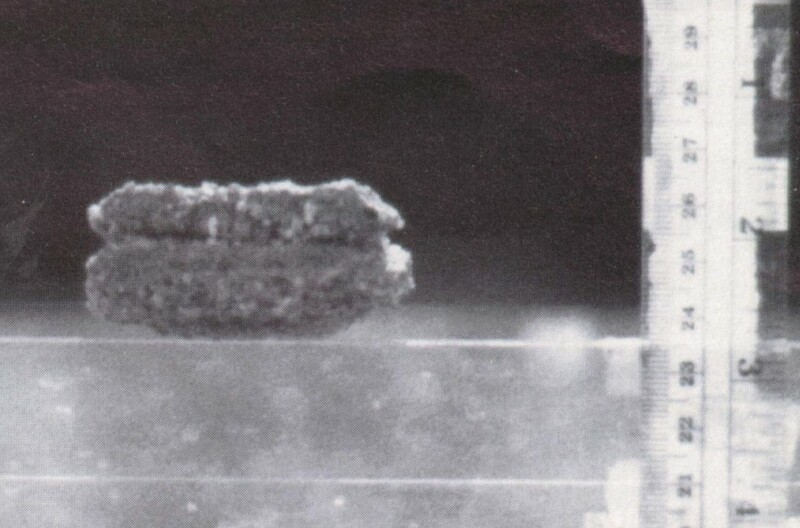 In running water, many closely related types of lamination appear in the deposit, even superposed (Berthault, 1988). Experiments in stratification were conducted in the Fort Collins hydraulics laboratory of the Colorado State University with professor of hydraulics and sedimentology Pierre Julien [video 2 : Fort Collins hydraulics laboratory]. For these, it was necessary to operate with water in a recirculating flume traversed by a current laden with sediment. As Hjulstrom (1935) and his successors had defined the critical sedimentation rate for each particle size, the current velocity would need to be varied. By modulating the current velocity, a superposition of segregated particles could be obtained. 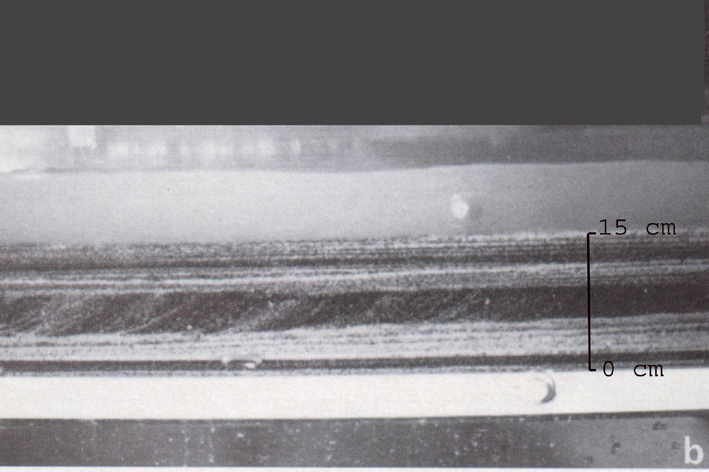 The flume experiment showed that in the presence of a variable current, stratified superposed beds prograde simultaneously in the direction of the current (Fig. 2) [video 3 ]. The result, on the scale of strata, is also conform, on the scale of facies [video 4 ] to Golovkinskii, Inostranzev and Walther’s law (Walther, 1894 ; Middleton, 1973; Romanovskii, 1988), according to which the extension of facies of the same sequence is the same both laterally and vertically [video 5 ]. Fig. 2. Typical longitudinal view of deposition (flow from right to left). 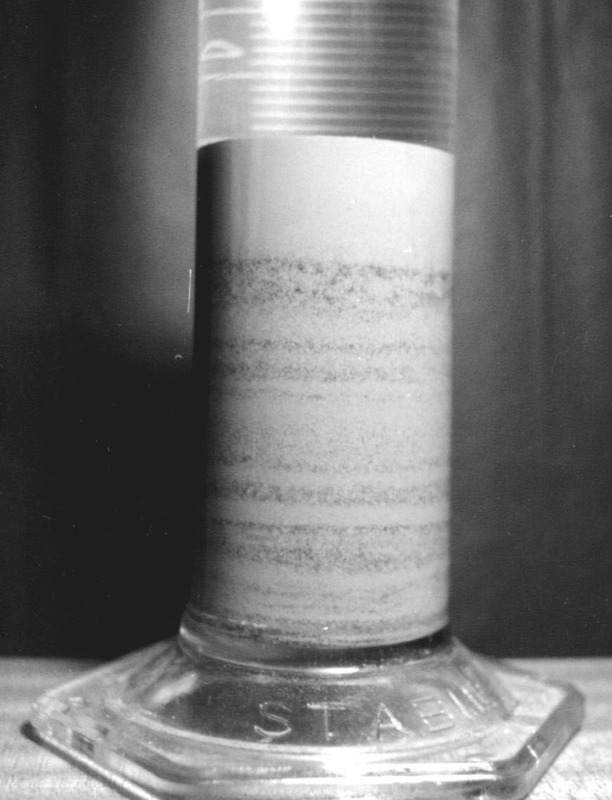 The report of the experiment entitled Experiments in Stratification of Heterogeneous Sand Mixtures was published in (Julien et al., 1993). This experimental study examines possible stratification of heterogeneous sand mixtures under continuous (non-periodic and non-interrupted) sedimentation. Three primary aspects of stratification are considered: lamination, graded beds, and joints. (1) Experiments on segregation of eleven heterogeneous mixtures of sand-sized quartz, limestone and coal demonstrate that through lateral motion, fine particles fall between interstices of the rolling coarse particles. Coarse particles gradually roll on top of fine particles and microscale sorting is obtained. Microscale segregation similar to lamination is observed on plane surfaces, as well as under continuous settling in columns filled with either air or water. Fig. 3. Results of experiments. (A) Schematic formation of graded beds. (B) Time sequence of deposit formation for t 1 < t 2 < t 3. (3) Laboratory experiments on the desiccation of natural sands also show preferential fracturing (or joints) of crusty deposits at the interface between strata of coarse and fine particles. 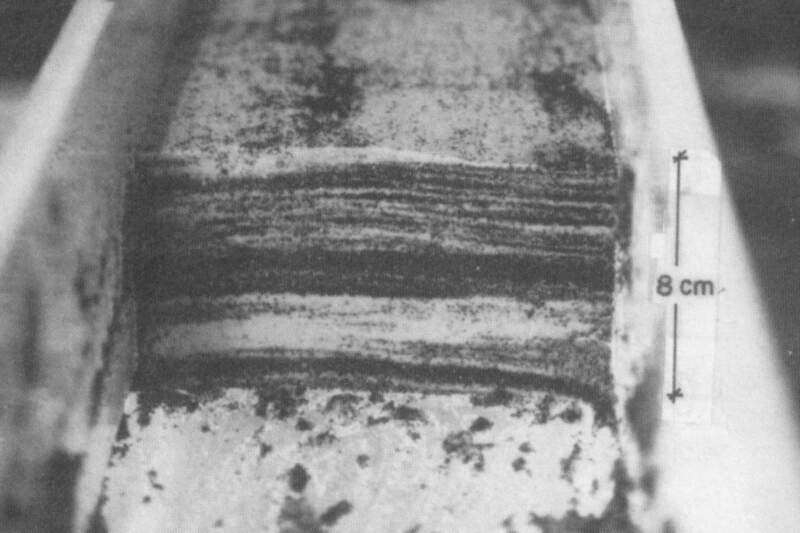 Rather than successive sedimentary layers, these experiments demonstrate that stratification under a continuous supply of heterogeneous sandy mixtures results from segregation for lamination, non-uniform flow for graded beds (Fig. 4) Superposed strata are not, therefore, necessarily identical to successive sedimentary layers.
. In this case the principle of horizontxality does not apply. It should not, therefore, be concluded that the dip of the strata necessarily implies tectonic movements subsequent to the horizontal deposit of the strata.